Jul 23, 2017: Apple's innovation. Sep 04, 2017: Trying to figure out how to play music in my car from a phone with no headphone jack. Jan 03, 2018: How the hell do I listen to music out of my phone while it's being charged? Feb 21, 2018: If Bluetooth headphones were included with phones without headphone jacks, people probably wouldn't mind as much the headphone jack was missing. Dec 10, 2018: Broke the aux input plug on my 2010 Hyundai Elantra and I was wondering if this product could help play music? 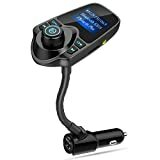 Jan 17, 2019: Bluetooth FM Transmitter with Best Call Quality? Mar 15, 2019: Sound only comes from right speakers when using FM tuner?